In October 1990, at the 15th Anniversary, we were first treated to the audio track of the long lost Barry Bostwick version of, "Once in a While". This was available *only* in the 15th Anniversary Rocky Horror Picture Show Box Set (still available), on the "Rocky Horror International" CD (or cassette tape). To be honest, I didn't think much of this version. It seemed awful flat, at least, in comparison to versions that showed up on various other cast recordings from the play. Years passed and we hoped and prayed that by the 20th, the video footage of that scene would appear, and it did! In October 1995, at the 20th Anniversary to the Rocky Horror Picture Show, the full video footage to "Once in a While" played on the big screen at the Roxy Theatre in LA (during the Friday night party), and then all day Saturday on multiple television sets in the lobby of the Pantages Theatre. Rocky Horror fans (myself in particular) stood in sheer awe of the power of the footage. What I had originally considered "flat" or "low energy" was perfect for Barry's deliverance of the song. On stage, this would be an atrocity. Rocky Horror Picture Show audiences would likely boo and hiss, and maybe even throw things. However, the true Rocky Horror fan (those of us who love the movie for the movie), found the lost footage to be an incredibly moving scene, with immense energy and emotion behind every glance, every movement, and every nuance. It was nothing short of incredible. The footage, itself, however, is not perfect. As was also rumored, the "transitional" footage, the shots that take us in and out "Once in a While", were supposedly lost. It would appear that this is true. The "Once in a While" footage we've been presented with begins with Janet at the monitor board, watching Brad smoking. This is the same exact scene as is played after she gets out of the elevator, and before Crim's speech leading into "Touch-a Touch-Me". The song starts and we see multiple "flashbacks" of Brad and Janet, at various other parts of the movie. After the words "She is gone...", we fade to Brad sitting on the edge of the bed, smoking. Altogether, the "fixed" transition is very, very well done, but one must wonder what was intended to be there. Additionally, there are words spoken by Janet (and also the Criminologist, I think), that are not in the song, or anywhere in the footage. It is yet unknown if this footage is lost, still missing, or was simply never shot. Last, Janet *does* appear in the "Once in a While" footage, back in her bedroom suite. How is it that she is at the monitor board, in the lab, then back in her bedroom, then back at the lab monitor board? We believe that the intention was that Janet was really viewing Brad on the monitor in her bedroom, but this was as close as they could get with the available footage. Bravo, we sincerely appreciate the effort. The footage for "Once in a While" is available on the 20th Anniversary LaserDisc of The Rocky Horror Picture Show. In that I recently acquired a Video Capture Board, I had considered making a QuickTime Movie out of the footage. However, it loses most, if not all its power, when limited to a 3x4" window. There really isn't much movement, and the result really didn't seem worth the effort. That, and I only have 2 megs of space on this Web server. :-( I did, however, do screen grabs on some of the better scenes and have provided them below ... in addition to the other shot I scanned in. So wash your face and phone my place, it'll be o.k. Download "Once in a While" in MP3 Format (1240k). Learn more about the MP3 format. 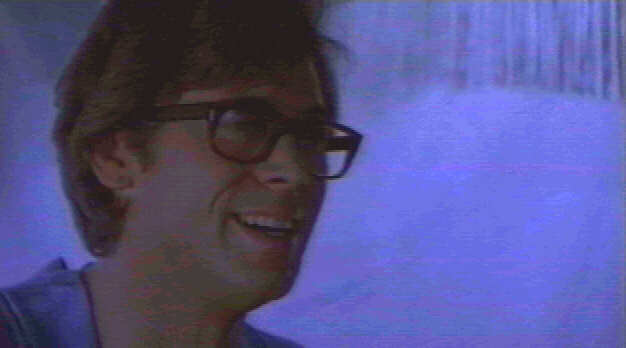 Back to the "Brad Majors Internet Shrine"